"Chad Nichols, Spartan Blades and KnifeArt.com. 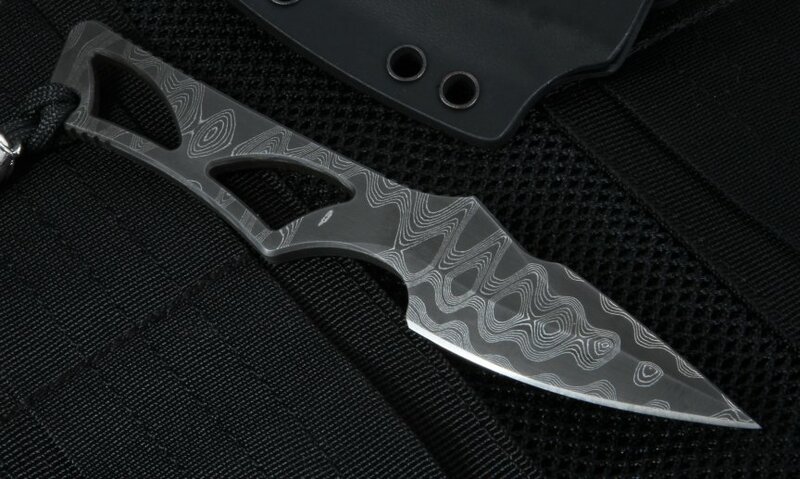 This stainless Fade pattern damascus Enyo looks as good as it performs." The Spartan Blades Enyo knife is named after the companion to the god of war, Ares, in Greek mythology. Featuring a fixed drop point blade of stainless Damascus steel in the Chad Nichols Blackout Pattern, the blade itself is CPM S35VN in 3/16" thickness, and a 59-60 HRC hardness. 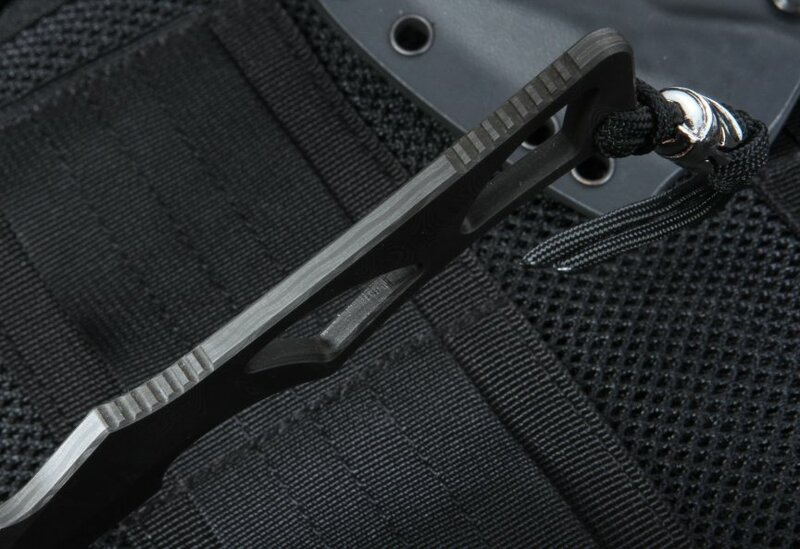 The sheath is made by Okuden and is Blade-tech hardware ready. This 6.25" knife is perfect for everyday use. It fits ergonomically and and has filed grooves on the handle for easy traction and a filed thumb ramp on the index finger guard and top of the blade. This is an American made knife that has the unique blackout pattern made of steel - right from Chad Nichols' forge in Mississippi. 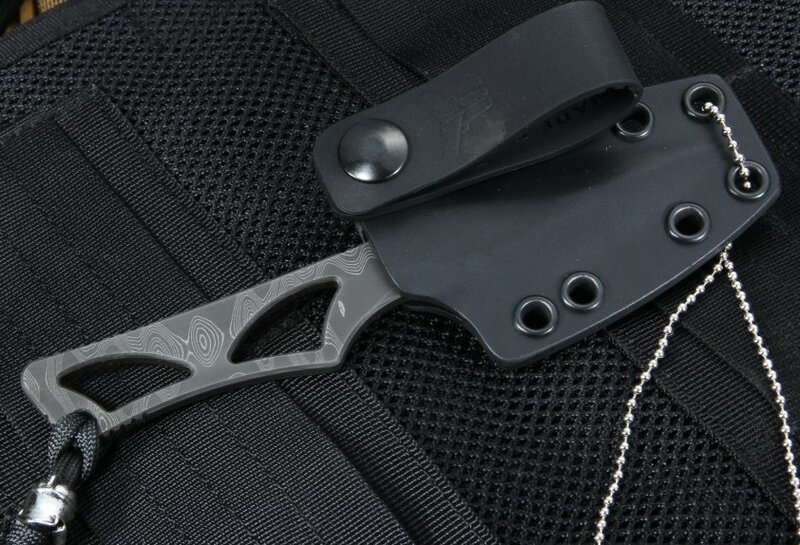 This is a beautifully crafted knife that is ideal for your pocket or around your neck with the para-cord lanyard with Spartan helmet bead and a lifetime warranty. 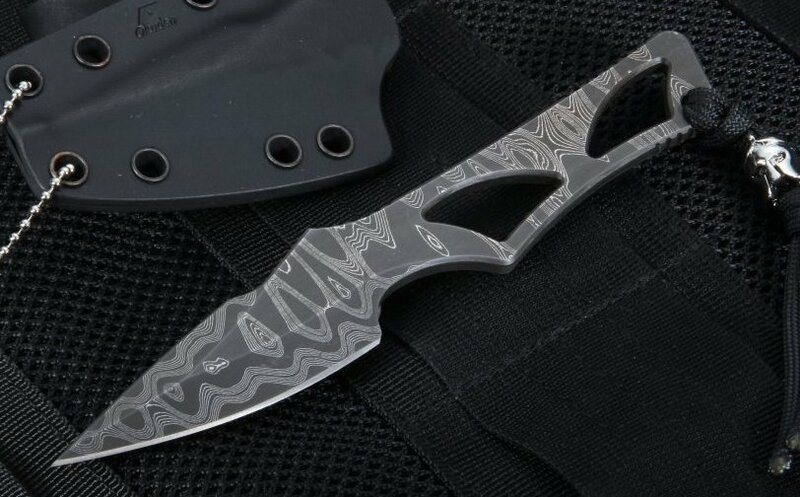 I first saw this knife in an article on a security specialist in an EDC magazine and was drawn to the full damascus look, the size & design was also interesting. I did a little homework to find that the pedigree on how it was made was only quality in every way.... it took me a little bit to find the full damascus version, and although on the expensive side at $350... I bought it, thinking I could pass it on or just add it to the collection. When it arrived it turned out to be better than my pretty high expectations in every way. For such a compact knife without scales, the skeleton handle has a very comfortable feel for my large grip and easily becomes a natural extension of my hand. The blade is very sharp and easily cuts through most everything like butter.... the leather sheath is well made but a little bulky with the removable belt extension (also comes with a neck chain). Again EVERYTHING about this knife is QUALITY.... and is well worth the price. The fact that it is American Made on a Mississippi forge only adds to its "southern charm." It quickly replaced my folder and my new edc knife. Nice knife. Love the Damascus. Handles very well. Very sharp, feels great in the hand, and comfortable to carry on the belt. Cuts well. Looks super-cool. I'll carry this fixed blade rather than a folder when I can. Terrific and quick customer service as always.